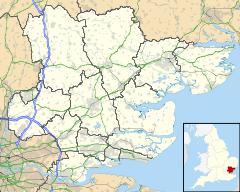 Little Dunmow is a village situated in rural Essex, England, in the vale of the River Chelmer about 3 miles (4.8 km) east-southeast of the town of Great Dunmow. It can be reached from the Dunmow South exit of the A120 by following the road towards Braintree (B1256) for 3.2 km before turning right for the village. The centre of the old village, which has just 99 dwellings, is a further 0.6 km along the road. The Flitch Way, a linear country park along the route of the old Braintree to Bishop's Stortford railway, links Little Dunmow and the new settlement of Flitch Green. The new village, built on the site of a former sugar beet factory, is a self-contained community of 850 dwellings and is another kilometre along the road towards Felsted. Little Dunmow formed the caput of a feudal barony the first holder of which was Ralph Baynard, as recorded by Domesday Book (1087). Arms adopted by Robert FitzWalter I c.1200 at the start of the age of heraldry: Or, a fess gules between two chevrons of the last. This is a heraldic difference of the arms of de Clare, his cousins. He was the builder of Baynard's Castle in the City of London and was followed by his son Geoffrey, whose son William rebelled against King Henry I (1100–1135) and thereby forfeited his lands. The barony was re-granted by the king to Robert FitzRichard (d.1134/6), younger son of Richard FitzGilbert de Clare (d.1091), feudal baron of Clare, Suffolk. He was succeeded by his son Walter I (d.1198) who was succeeded by his son Robert FitzWalter I (d.1235), founder of the family of FitzWalter, who left as heir a minor, his son Walter FitzWalter (1219–1258). Walter's son was Robert FitzWalter II (1247–1326). His son was Robert FitzWalter III (d.1328) who was succeeded by his son John FitzWalter (1315–1361). The Parish Church was founded in 1104 by Lady Juga Baynard, wife of Ralph Baynard. After her death her son Geoffrey Baynard founded in 1106 an Augustinian priory dedicated to St Mary. One of its canons served as curate to the parish. The majority of the original structure has been lost but the Lady chapel survives and became the east end of the choir of the large and stately Little Dunmow Priory church, now the Parish Church. It retains the magnificent columns and beautiful Gothic windows as evidence of its former grandeur. The monastic buildings stood to the southwest of the church but, along with much of the Priory, were razed to the ground after the Dissolution of the Monasteries, when the priory site, with the manors of Little Dunmow and Clopton Hall, were granted to the patron of the priory, Robert Radcliffe, 1st Earl of Sussex. Many fine 14th, 15th, 16th and 17th-century buildings may still be found in the village, notably Priory Place (on the site of the old Priory), Brick House (beside the footpath to Barnston as it approaches the Chelmer valley), Ivy House (at the junction of The Street and Brook Street, Monks Hall (at the junction of The Street and Grange Lane) and Rose Farm (At the Junction of Grange Lane and the Street). A number of thatched cottages are scattered around the village. Conservation Area The centre of Little Dunmow has a defined conservation area. In late 2013 Uttlesford District Council held a conservation area appraisal consultation. The .pdf file that accompanied the appraisal is a concise source of information describing buildings of architectural and historic interest and their relationships within the village. Little Dunmow was the original home of the Flitch Trials which now take place in Great Dunmow every four years. The ancient Flitch of bacon custom rewarded a couple who had been married in church and remained 'unregreted' for a year and a day, with a flitch of bacon. The claimants had to swear an oath kneeling on two sharp pointed stones in the churchyard. They were then carried through the village to be acclaimed. In later years they were carried in the Flitch Chair, thought to be made from pew ends from the Priory Church. The original kneeling stones and 15C Flitch chair can still be seen within the church. As of December 2008[update], the Parish of Little Dunmow had an electoral population of 1459 divided between the old village (259) and the newer development of Flitch Green (1200). Flitch Green became a separate civil parish in April 2009 under an order made by the local authority, Uttlesford District Council, but retains Little Dunmow as its postal address. On 13 December 2007, in response to the Uttlesford Core Strategy preferred options consultation, developers Chater Homes announced a proposal to build 3,000 houses in an area provisionally dubbed "Chelmer Mead", which would have greatly expanded the 90-home settlement of Little Dunmow. Opponents of the Chelmer Mead scheme expressed fears that it could link Little Dunmow with a number of surrounding settlements and erode the individual character of each. This proposal was shelved as according to the company's director Ian Chater, "The feedback we received was that this was too big so we have now reduced it substantially." Chater Homes put forward a substitute proposal for 750 homes to meet the changing requirements in a further Core Strategy consultation, but it had not as of October 2010 gained sufficient local support. The September 2010 statement from Uttlesford District Council notes in para 32 that "the District Council can determine how much local growth to accommodate" and in para 33 that "There is no obvious focus for growth in the district". In common with most developers, both Chater Homes proposals were submitted on the last day of the consultation process and hence were unavailable for detailed comment. In August 2013 Chater Homes requested a Scoping Agreement regarding a new 750 home proposed development in the same general area as earlier failed planning applications.The District Council responded on 12 September 2013 It is notable that Little Dunmow has never featured as suitable for large developments in the Council's regularly updated Strategic Housing Land Availability Assessment. In September 2014 Chater Homes and Home Group submitted an Outline Planning Application for the 750 home development. The application was refused in March 2015 Comprehensive reasons for the refusal may be found via the Uttlesford District Council planning portal. A further proposal for 400 units in response to a Call for Sites exercise as part of the new Uttlesford Local Plan was again held to be unsuitable on the grounds that it would not contribute to sustainable patterns of development and would have detrimental impacts on historic assets. ^ "Essex country parks, countryside day out, visitparks.co.uk, Great Notley and the Flitch Way". Visitparks.co.uk. Archived from the original on 5 June 2013. Retrieved 29 June 2013. ^ "Welcome to the official Dunmow Flitch Trials website". Dunmowflitchtrials.co.uk. 14 July 2012. Retrieved 29 June 2013. ^ "Protesters fight 3000 homes plan" (Dunmow Broadcast news article on 3,000 house proposal in Little Dunmow/Chelmer Mead). Archived from the original on 13 January 2008. Retrieved 21 December 2008. ^ "Essex village faces a new battle over housing – News". Dunmow Broadcast. 18 March 2010. Retrieved 29 June 2013. ^ "Uttlesford District Council" (PDF). Uttlesford.gov.uk. Retrieved 29 June 2013. This page was last edited on 18 January 2019, at 08:23 (UTC).